du Bray, Edward A.; Day, Warren C.; Meighan, Corey J.
du Bray, E.A. 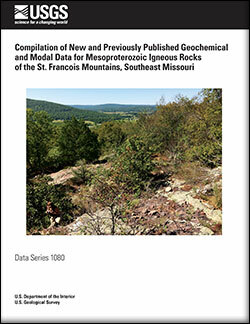 Day, W.C., and Meighan, C.J., 2018,Compilation of new and previously published geochemical and modal data for Mesoproterozoic igneous rocks of the St. Francois Mountains, southeast Missouri: U.S. Geological Survey Data Series 1080, 10 p., https://doi.org/10.3133/ds1080. Harlov, Daniel E.; Meighan, Corey J.; Kerr, Ian D.; Samson, Iain M.
Goldfarb, Richard J.; Meighan, Corey J.; Meinert, Lawrence D.; Wilson, Frederic H.
Goldfarb, R.J., Meighan, C., Meinert, L.D., and Wilson, F.H., 2016, Mineral deposits and metallogeny of Alaska, In: Boyd, R., Bjerkgård, T., Nordahl, B. & Schiellerup, H. (eds. ), Mineral Resources in the Arctic, Geological Survey of Norway, (in press).